Dr.P.Mukundan is a leading practitioner practicing at steel city Salem since 28 years. He had contributed many articles in various scientific journals and presented many papers in seminars and also participated in public awareness programs. 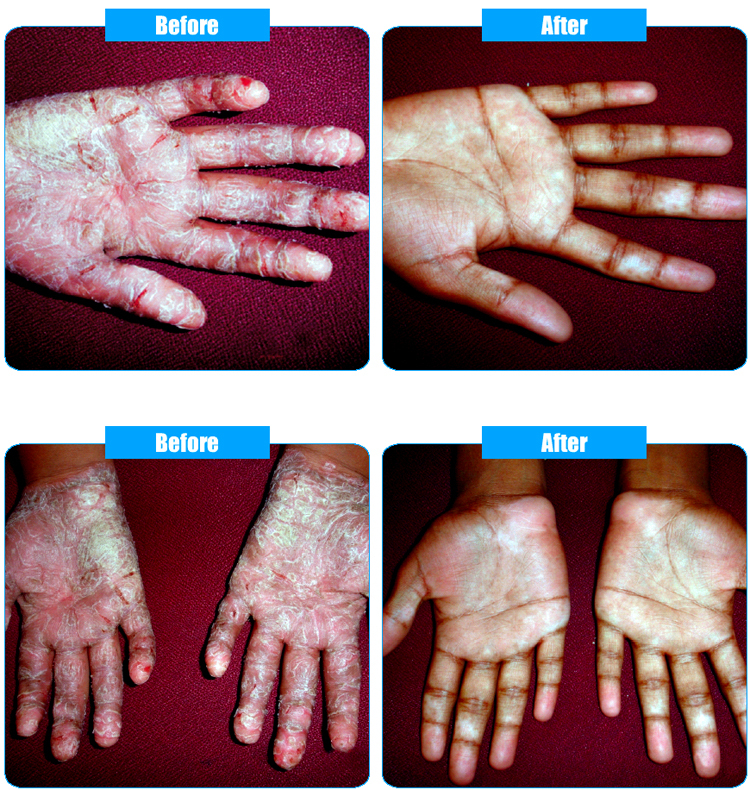 A boy aged 12 years, was suffering from palmoplantar psoriasis severely since 3 years. Despite of heavy medication internally and with topical application, he was not having much improvement. He had deep cracks and bleeding with severe pain on both his palms and soles. Itching < in night. Itching > washing with hot water. Initially the cracks appeared at the edge of the fingers, gradually scaling started all over the palms and soles symmetrically. The lesions were fissured with bleeding marks and covered with silvery scales. He was away from the school for few months since he could not hold the pen due to severe pain in the cracks. He was restless in the clinic and changed his place every now and then. He was lean and physically very weak and tired. • Restlessness and changes his place often. • Irritable and worried about his complaints, wants every thing clean and neat. Itching < with deep cracks. The patient’s skin condition was better and he was on SL for these periods. The medicines were stopped since 5 months and the case is being observed. Psoriasis has been called the marriage of all the three miasms as quoted by H.A Roberts. This case predominately presents all three miasms. The dryness of psora, the thickened skin of sycosis and the squamous character of syphilis but active miasm during my consultation was sycotic in manifestation due to the thickening of the skin and the exfoliative tendency. In this case the itching without pus or discharge and cracks on the hands and feet with extreme dryness are psoric, the thickened skin of sycosis and the deep cracks and fissures in the skin (mainly in the palms and soles) are syphilitic nature. My choice was Arsenicum album since its covers the constitution as well as miasmatic background,which helps to clear up the suppressions, the presenting symptoms from its root and the susceptibility for psoriasis and thereby strengthening the constitution. Psoriasis is expected for recurrence, in this case no such relapse of the symptoms so far.